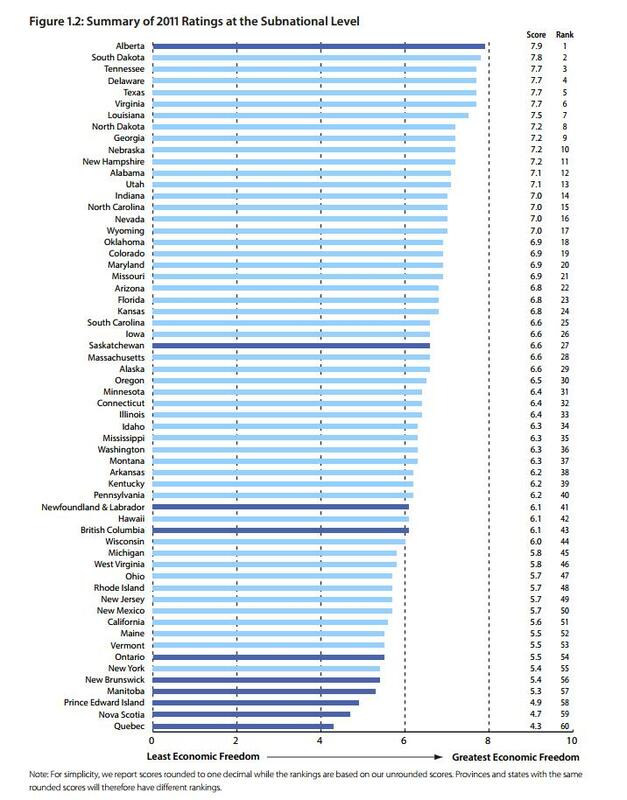 And here’s the ranking for economic freedom in states and provinces. As you can see, Alberta and Saskatchewan are in the top two spots, followed by the American states of Delaware, Texas, and Nevada. But the previous table looks at the combined impact of national and sub-national government policies. If you look at the policies that sub-national governments actually control, the rankings change a bit. Alberta still comes in first place, but Saskatchewan plummets. 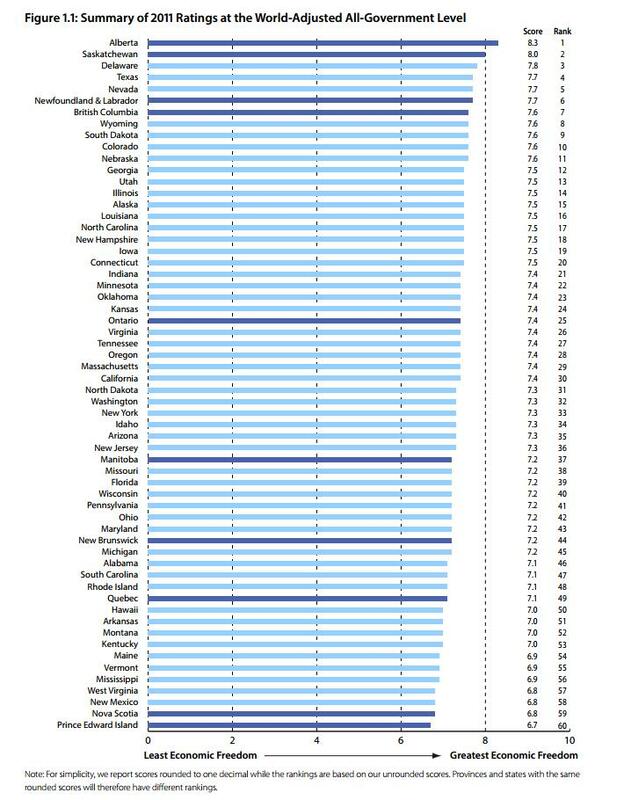 Meanwhile, the best American state is South Dakota, followed by Tennessee, Delaware, and Texas. Canadian provinces dominate the bottom of the rankings, with Quebec coming in last place (too many language police?). The worst American state is New York, which isn’t a big surprise. And since Vermont was the top state in the Moocher Index, it’s also hardly a shock that it’s the next worst state. One pattern you may have noticed is that American states without income taxes tend to be near the top of the list. So does this mean that I’ve changed my mind and I’ll escape to Alberta when a future President Elizabeth Warren destroys America? Mehh….it’s still too cold for my tastes. Freedom is important, but I want someplace where I can play softball more than two months per year. P.S. As this joke indicates, American leftists used to think about escaping to Canada. Times sure have changed. Need to update this to reflect the changes in Canada. Amazing how quickly a well managed economy can not just stumble but hurtle itself off a cliff on a fast past to decline. Canada has taken a turn for the worse at the Federal level with the current Liberal government piling on the debt, Ontario Government thinking it’s a debt race and trying to out debt the federals. Alberta trying to commit economic suicide by punishing itself for producing Oil and Gas (The horrors), and green energy policies popping up Federally, and provincially to accelerate the economic decline. What was once a happy optimistic perspective has become very gloomy forecast. on January 23, 2014 at 4:21 pm The Best State in America Is…? What a shocker. Alberta is the most economic free and has the best economy, the most prosperity and jobs. My province, New Brunswick, is close to the bottom and our economy is crap. What I find most interesting about these state/province studies is the lack of data for Mexican states. If I were an enterprising policy wonk I’d start trying to dig up data on the 31 states (plus the federal district) south of the border. Can you imagine how cool the map featured above would look like with the Mexican states accounted for as well? If you are still shopping for a young child gift for Christmas, this new Louisiana business has gifts. and watch this cute little girl lose her tooth. So one of the best places in the US to survive the coming apocalypse is Nevada? Who’d have thought. At the same time, while Alberta may not be perfect and it may be difficult to find work there, no one can beat the scenery. I’d put Alberta ahead of Texas or Nevada (and I’m a Texan). As an American who works in Canada, I agree that single-payer is not the answer. I’ve been waiting 2 months for knee MRI. At my US residence, I could get one the next day. As for housing, a 2 bedroom ranch/bungalow on a 40 ft lot in central Toronto will cost between $700,000 and $800,000. A 2 br condo in a not-luxurious building will cost about $300,000. Toronto, perceived as civilized and safe by the upper-middle-class all over the world, is filling up with Russians, South Koreans, Iranians, Israelis, South Africans, South Americans, Mainland Chinese, all looking for safety and stability for their families. They are buying condos and homes, sending their families here, and running their homeland businesses either solo back home, or from Toronto. Where else will you see the Jewish neighborhood and the Iranian neighborhood side-by-side, living peacefully, doing business together? Where else will you see a mosque and a synagogue side-by-side, sharing a parking lot? Ontario used to be the industrial powerhouse of Canada. However, since being saddled by a left-wing provincial government, manufacturing has been fleeing, energy costs have been skyrocketing, with an increasing trajectory, and the provincial finances are worse than California’s. I lived in Canada during the mid-1980s as the child of American ex-pats. Went back last year for a high school reunion and showed the wife and kids around my old southern Ontario stomping grounds. Toronto had more cranes working than Chicago in 2005 when OPM was being used to fill the sky with condos. If that is a measure of economic activity, T.O. is booming. I offered to trade my classmates our President for their PM straight up. I even threw in three draft picks. I got no takers. And just in case anyone else brings it up — no, single-payer healthcare is not the secret sauce in Canada. Andrew Simmons: I am an Albertan, and I think you are being way too harsh. I’m no fan of public health care, but your claims about our system are just wrong. Mammograms are widely available to those who want them. My wife has never had a problem seeing an ob/gyn. Your comment about Ophthalmologists is strange, as I’ve been to one many times and have had no problem being scheduled. Of course health care is rationed. Knee replacements and other quality of life interventions typically have long waiting lists. But it’s not nearly as bad as you’re suggesting. I don’t know what basket of goods you are using to compare Canadian and American prices, but a quick check on Amazon.com vs Amazon.ca will show that consumer goods are roughly on price parity. Housing prices vary by region as they do in the U.S. Some autos seem to be priced quite a bit higher, while others are very close to U.S. MSRP. It’s hard to compare them because the option packages are always different and the regulatory standards are also different which adds costs to the smaller market. The bottom line for Canada is that we now have a smaller government than does the U.S. Our tax system is less progressive. Our government also seems to be far less ‘in your face’ than is the federal government in the U.S. Here in Alberta we have a low, flat provincial income tax and no provincial sales tax. Our combined top marginal tax rates are lower than in most U.S. states. Not only that, the trend lines between the two countries is reversed. Canada is on a trajectory towards lower taxes, even less government, and we are projecting a balanced budget in just two years. In the U.S., government is growing, taxes are increasing, and a balanced budget is not going to happen ever. Canada’s debt to GDP ratio is lower and will soon be falling, while the U.S.’s is higher and increasing. The fact that we are ranked freest in spite of a public health care system tells you that in areas other than health care we are substantially more free. I’ve always known I am blessed to have been born an American. Until the last ten years or so that I’ve had an opportunity to travel and see quite a bit of the rest of the country, I never realized how doubly blessed I am to have been born a Texan. As someone who moved …hmm …**escaped**!!! …from California to Washington (state) just two years ago, and who was able to buy a house (for the first time in my adult life: and I’m nearing retirement bucko), I think your list is full of manure. Washington has it’s issues, granted. But for California …Cali-frickin’-fornia??!!?? …is some major fail. Someone’s parameters are hilariously misplaced. Illinois is as free as Texas? Who knew? Maybe Chicago is one, huge outlier. How the HECK is Illinois near the top of the list? Bizarre. Any “study” that ranks California among the most receptive to free enterprise is idiotic on its face. I’m not sure I entirely understand why the state-to-state rankings change so dramatically based on whether the impact of federal policies are included or not. Particularly the change in NY’s ranking. NY residents pay far more in federal taxes than they get back in federal spending, so one would think that NY’s ranking would *climb* when the impact of federal policy was excluded. Is it the Fraser Institute’s assessment that there’s something in the federal regulatory climate that so heavily favors doing business in NY as opposed to other states that it offsets that imbalance of payments? I lived in Alberta in the late ’90s and then worked there again a decade later as an investment specialist in the energy industry while living in Ontario. It is indeed a splendid, beautiful and free province, especially compared with the rest of statist Canada (such as Ontario, where I spent 5 yrs. and which resides at the bottom of the North American economic freedom list with New York.) It’s analogous to Texas in spirit and outlook, though much less ethnically diverse and ebullient. However, as an American who happily returned to the U.S. just prior to the onset of the financial crisis I can tell you that economic and political life in Canada, even Alberta, is much less pleasant than in the U.S., even at the depths of our current malaise. As the McKinsey Global Institute documented in a splendid report last decade, the Canadian economy is much less productive as the U.S. (on the order of 20% less); salaries lag accordingly. In addition, the retail sector is extremely sclerotic and bereft of competition or innovation compared with the U.S. Supply chains are much less developed, costly and inefficient. This results in prices for comparable goods that are on the order of 25-100% higher than those in the U.S. on a currency-adjusted basis. Most people we knew in Ottawa who could afford to travel went across the border to the retail paradise (!) of Syracuse, New York to shop. Add in grandfathered trade barriers under NAFTA to products such as wine and life as a consumer in Canada is distinctly unpleasant to an American living there and aware of the disparities. In addition, the housing stock is of much poorer quality than the US’ right across the nation. Ottawa in particular was terrible, partially because of a greenbelt that restricted development and inflated prices in the urban core among a population that lacked further income to upgrade properties. Then there’s the dismal provincial-run health care system in which private care is essentially criminalized. The result is a two-tier system where anyone with means either goes to a private clinic in Quebec (the existence of such clinics was a political sop to separatists; these are the favored treatment locale of political and government leaders) or to the U.S. The remaining Canadians are trapped in a system in which even basic care is extremely rationed. My Canadian wife, in her 40s when we moved to the U.S., had never been able to have a mammogram in Canada. Now she has one every other year. Her option for an Ob-Gyn exam every year was limited to a general practitioner because a proper Ob-Gyn specialist is rare and available only upon referral in case of incipient illness. And forget about making an appointment with an ophthalmologist for a thorough medical eye exam. An optometrist is all you’ll find unless your GP diagnoses you with a serious eye condition. Alberta is indeed the best place to live in Canada, from an economic and lifestyle point of view. But even Calgary, the energy capital of Canada (akin to Houston), is still an incredibly parochial town with business process standards and human capital levels far behind the U.S. Among the many problems that Canada has is a relatively small (30 million), risk-averse population spread across a vast distance with minimal public discourse about how liberal economic policies would benefit its citizens. It is, as a commentator during the ’90s noted, a “vast land of uniform and unexamined opinion.” Check out the Fraser Institute Web site for research documenting this thoughtless illiberalism and its costs. We thought long and hard about moving permanently to Calgary but, even with the mountains outside our window and 45 minutes away, it would still be a less attractive place to live and work than comparable U.S. cities. Canada has enormous human capital reserves and great potential but an economy that still relies on natural resources and banking. It’s an anti-entrepreneurial place, though I retain a soft spot for its many charms. As a dear Canadian friend of mine has lamented for years: “Canada is a country with first-rate-people, a second-rate economy, and third-rate government.” Even Stephen Harper, an economic liberal at heart, hasn’t managed to transform this lovely place. Err, North Carolina is ahead of Alaska on the graphic, but it is behind in Figure 1.1. Looks like they are built from different datasets. Illinois? “Most free”? Clearly nobody in the Fraser Institute has tried running a small business here in the Chicago area. I’m not that surprised at the Canadian rankings (Alberta good, Quebec bad), but some of the US rankings surprise a great deal. California ranks relatively high. North Carolina ahead of Alaska? What gives?